See a complete list of the best pizzerias in Staten Island, and order a slice or two of the best pizza Staten Island has to offer! If you're searching for the best pizza on Staten Island, Fun New York is your definitive guide. Great Thin Crust Pizza in Staten Island! A family owned pizzeria in Staten Island, Joe & Pat's serves up some of the finest thin crust pizza in all five boroughs! Established in 1960, the family-friendly restaurant is open 7 days a week for lunch and dinner. Enjoy pizza or other delicious Italian specialties within an expansive, air-conditioned dining room. Draft wine and beer selections are available. Hours are 11 A.M. to 10:30 P.M. on Sundays through Thursdays, and 11 A.M. to 11:30 P.M. on Fridays and Saturdays. Also offering delivery services; Joe & Pat's serves the Staten Island, Brooklyn, and Manhattan areas. If you have any questions, please call 718-981-0887 or send an e-mail to joeandpats@verizon.net. Some of the Best Pizza on Staten Island! 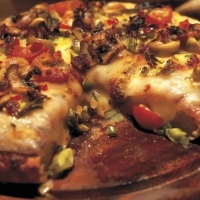 Enjoy award-winning pizza at one of the best pizzerias in Staten Island! A popular lunch and dinner spot amongst locals in Staten Island, Goodfella's has been featured on many TV stations, as well as in magazine articles and newspapers. Over the years, the place has become a hot spot for politicians and celebrities. The scrumptious artisan pizza is made with such ingredients as imported San Marzano tomatoes, fresh mozzarella, extra virgin olive oil, and gourmet sauces made from scratch. 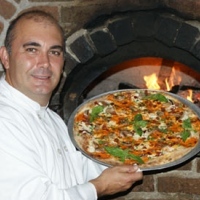 The pizzas are cooked in a real wood-fired brick oven at 800 degrees, increasing their flavor. Goodfella's also offers a nice wine list and homemade sangria. To top it all off, the staff is incredibly friendly!